I'm using xrandr 1.2 in order to easily manage external monitors with my laptop. When I plug it I get a bigger desktop, where the external monitor shows the top of the desktop and the laptop's screen the bottom. When I start awn, it appears in the middle of the external screen while it should appear at the bottom of the laptop's screen. An screenshot is attached. 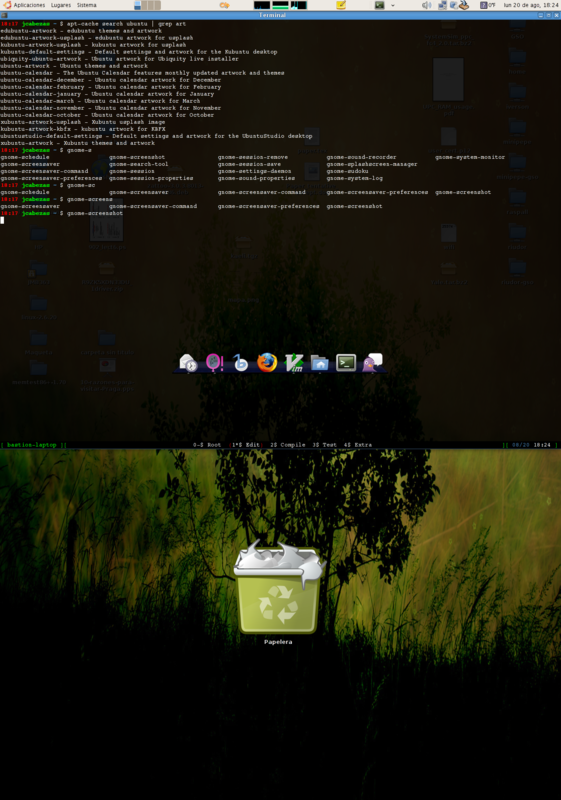 I am using Ubuntu Gutsy, compiz fusion, xrandr 1.2, xorg 7.2, and awn HEAD (bzr revision 53). The laptop is an Intel Core Macbook with an integrated Intel 945GM graphics chipset. The resolution of the external monitor is 1280x1024, while the laptop's screen resolution is 1280x800. Adjust the "monitor_height" to 1024 and and check "Force Monitor"
Yes, it works now. But I think it's only valid as a temporal workaround since I must change the gconf values if the resolutions of the monitor/s change. I would keep the bug open. This something I wish to work on in the next release (in which I plan to internally support xrandr). Hence I am setting the milestone to 0.3. Busy fixing this issue. Only need to test it myself, but I don't have gutsy (my brother has), therefor you will have to wait till I get him to test it. Here is the patch. Can some guys confirm it works under different configurations, before I commit it? It works better now. However, it is still placed in the upper monitor (the external one) of my vertical virtual desktop (I execute "xrandr --output LVDS --mode 1280x800 --output VGA --mode 1280x1024 --above LVDS"). Furthermore, as I use the "automatically hide" option of awn, it hiddes from the upper monittor but appears on the top of my laptop's screen.